Welcome! Our portal is dedicated to physical and personal development. We welcome sport in all its manifestations. Here you can find mobile applications that will help to properly conduct training, videos that can be included during training, music (download mp3), which can be downloaded to the player and listen to it during training, online timers that are easy to use anywhere in the world with Bad connection, interesting articles. One of the directions is Tabata. This is a high-intensity workout with a fixed number of rounds and a fixed length of time. The meaning is simple: Only 8 rounds, which last 20 seconds, after each of them 10 seconds break for rest. Your task is to perform the exercises during the round of "work" and rest during the "recreation" round. In the progression of your training, you must increase the total number of repetitions per workout. More details can be found in the articles. Another great direction is Android applications. Here you will find not only sports timers, but also useful applications that will help make your life more comfortable. Join now! - The opportunity to set the time interval between Tabata, if several cycles. - Fixed a bug the last signal. - Optimized for Android 6. 22.07.2016 Added audio Tabata Timer - Mix (Rock & Rap) (RU). 20.03.2016 New update applications Tabata Timer L for Android. 12.11.2015 Added audio. Tabata Timer (Electronic dance). 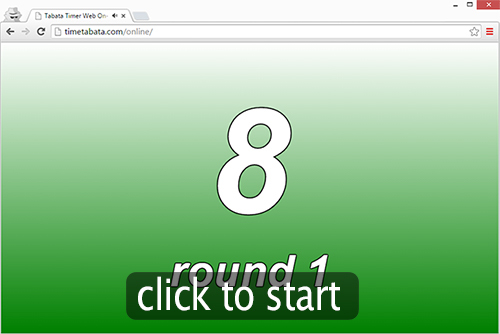 11.11.2015 Added Tabata Timer Web OnLine. If you have a slow internet connection, then this is for you. 11.08.2015 Added video. Tabata Timer (Electronic dance). 29.04.2015 It was created project page in facebook. 06.02.2015 Added Guestbook. Your opinion is important to us. Fixed problem with menu. 05.01.2015 Added video and audio sections.